Why shepherds? What made them so special, that they were the first to receive the news? Well, I can’t claim to know the mind of God and all his numerous reasons for choosing shepherds, but several years ago, I had a thought and it been something that I joyfully meditate on each Christmas. Bethlehem lies 5 miles south-west of Jerusalem. During the time of Christ’s birth, the temple was located in Jerusalem. This temple was the place where the Jews worshiped God through sacrifices. According to the historian Josephus, there were about a quarter million lambs sacrificed during the time of the passover. A lamb, by the way is a sheep under 12 months old. So here we have shepherds, within five miles of Jerusalem, keeping watch over sheep, during what was most likely the month of October (within the week long Feast of Tabernacles. This feast is all about God dwelling with men. Thanks Mikie!). Since the Passover was held on the 14th of Nisan, which was the first new moon of spring, we can surmise with a fair amount of accuracy that these shepherds were watching over lambs that would eventually be sacrificed during Passover. How incredibly neat is it, that those that were first told of the birth of the perfect Lamb of God, were these shepherds? 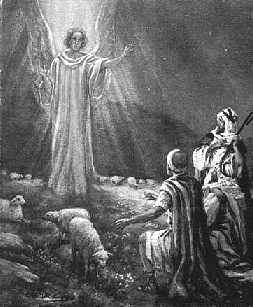 From tending lambs destined for sacrifice, the went to see the perfect Lamb, the final sacrifice. That’s why Jesus was born. To die as a sacrifice for my sins. For your sins. To shed His perfect blood, so that you and I may stand before God. Amazing grace, indeed. This entry was posted on Wednesday, December 23rd, 2009 at 2:08 pm	and tagged with bible reading, bible study, God's Awesomeness You can follow any responses to this entry through the RSS 2.0 feed. I also think it is amazing that the news was first told to those that would receive it– not rulers or kings or wealthy merchants, but common ordinary shepherds. At church this past Sunday, there was one part that particularly stuck out to me. And on earth peace, goodwill toward men! SUDDENLY! Can you imagine what those shepherds saw?! The HOST of Heaven! Not singing like some choir, but praising God! WOW. I can imagine the hillside being covered with the heavenly host. Gives me goosebumps! MERRY CHRISTMAS, my friend! Thank you for being a part of my life– even through digital distance. I so appreciate your comments and prayers. We have the same heart, I think.